Pressed from the almond nut. 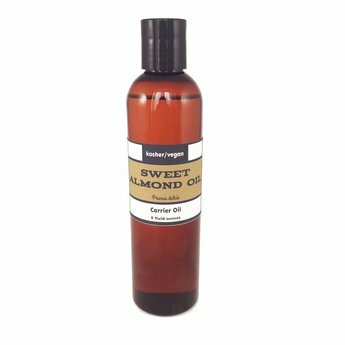 Sweet Almond Oil is a light to medium weight oil with medium skin penetration speed. It has excellent emollient properties and is known for its ability to soften and re-condition the skin. It is rich in proteins, linoleic acid and vitamin D, and is considered extremely nourishing - particularly when used regularly. It can be expected to sooth dry skin and irritated areas. When used in soaps, it saponifies easily to a mild soap with good lather. It has no taste, and so is great for use in lip products. With its high nutrient and oleic acid content, it is a great all-round oil that helps sooth distressed skin. Sweet almond is to be differentiated from the inedible bitter almond, which contains cyanide; a potent poison.